Authorised retailer for Superdry Watches. Free delivery, 30 day free returns and five-star rated service. Buy now with up to 12 months 0% finance. Superdry are a trendy clothing brand who are incredibly popular thanks to the quality and effortlessly cool style of their clothing range. Even though Superdry never seeking celebrity endorsements their clothing has been worn by the likes of David Beckham, Kate Winslet and Leonardo Di Caprio. The Superdry watch range features a number of incredibly affordable watches which match the personality and distinct style of the Superdry brand. Superdry were founded in 1985 trading under the name Cult Clothing by Julian Dunkerton and Ian Hibbs. The Cult Clothing brand expanded across the UK during the 80's and 90's opening a number of retail stores. In 2003 Julian partnered with James Holder, creator of the Bench brand of clothing, to create the Superdry brand. The brand exploded in popularity in 2005 when David Beckham was pictured wearing the brands clothing in a calendar. Superdry have stores all over the UK and the brand is sold in over 100 countries around the world. Superdry watches appeared in 2012 and have become an incredibly popular addition to the range. Just like the Superdry clothing range, Superdry watches are casual, fashionable and cool. 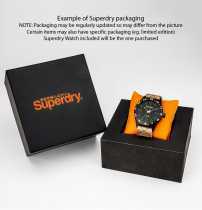 The watches capture the unique style of the Superdry brand, which makes them a must buy for anyone who enjoys casual fashion. Watches like the Superdry Gents SYG111O display a modern, sporty style with the dial inspired by a cars speedometer, while the Superdry Gents SYG104T carry a more traditional design while retaining the brands trademark cool image. Superdry watches come in a range of prices, but the entire range is incredibly affordable. You can find some unbelievably stylish watches for less than £50 and fantastic high-quality watches come in at under £150! The Superdry watches provide a casual, stylish addition to any outfit and with the watches coming in at such an affordable price there's no good reason not to pick one up today!